An email sent by the Student Service Centre of UoL reminded its international students not to cheat on exams, with the word "cheating" written in Chinese. This quickly sparked widespread controversy among overseas Chinese students and netizens in China. Many hit out at what they called a racist email from the university, which said that "students who were caught wubi [Chinese for cheating] in exams would suffer serious consequences, such as getting zero marks, suspension for one year or termination of studies." A later explanation from the Student Services Centre of the university tried to brush aside the criticism, claiming that they provided the translation because Chinese students are usually unfamiliar with the word "cheating" in English. It clarified that "the inclusion of the Chinese translation was certainly not intended to give the impression that the exam misconduct advice was aimed at Chinese students. We have had feedback from Chinese students in the past regarding the terminology so were addressing this to ensure our advice was clear." This explanation did not convince many on social media platforms. Many questioned why it put the word "cheating" only in Chinese, but not in any other languages on the school's official website. The notice was deemed "discriminative against Chinese students" and has angered and saddened many Chinese students who have travelled thousands of miles to study in the UK and are unable to return home for family reunions during the upcoming Chinese Spring Festival. The university's vice-chancellor, Dame Janet Bear, apologized to students on January 15 via an email sent to all international students. "It was wholly inappropriate and I apologize wholeheartedly for the offence it has caused." According to the report, the UoL has a close relationship with China and ranked first among the top 10 most popular British universities for Chinese students. The university had about 3,200 Chinese students in 2016. Approved by the Ministry of Education (MoE), Xi'an Jiaotong-Liverpool University (XJTLU) was founded in 2006 as an international joint university based in Suzhou, East China's Jiangsu Province. It was the first Sino-British joint venture between research-led universities and the result of a partnership between the University of Liverpool and Xi'an Jiaotong University. There are currently about 95,000 Chinese students in the UK , making it the largest group of foreign students from any country. A number of international students hit back on the UoL's official Twitter account. A student named "Wenfei Li" said, "Is cheating a complicated word for us? Maybe discrimination is much more complicated than that." "The obvious implication was either that Chinese are cheaters or too stupid to understand English… How backwards is that? And all we get is a half-serious Twitter apology. Ridiculous!" another Twitter user "Amber" commented. "I can't believe my Uni is sending this racist email. Ironically, it is from the 'international office.' It was so disgusting," another angry post said. Another student named Kevinwinsper on Twitter questioned the explanation. "There was no misunderstanding, simply prejudice and racism. Anyone admitted to UoL has to meet a minimum English language requirement. 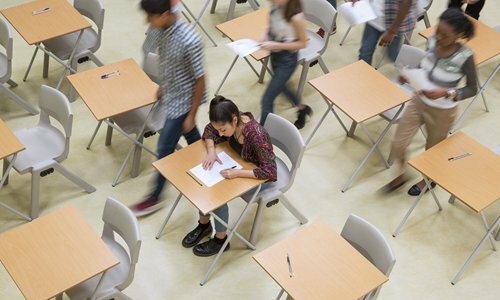 Claiming that Chinese students do not understand the meaning of 'cheating' is the same as saying there is a loophole in the admissions process." The furor has also sparked strong debate on Chinese social media. One netizen mocked the tone of the university, saying that "the students service staff of UoL are usually unfamiliar with the Chinese word 'zhongzu qishi' in Chinese, so we will provide its translation in English: Racism." More than 1,000 students signed a petition on the website Change.org by January 16, criticising the university for irresponsible, arrogant, and discriminative action that hurts all international students, especially those from Chinese-speaking countries and regions. "There was a paragraph in this email which caused significant offence and has upset our students, parents and partner organizations. This was a mistake and is not representative of the high regard in which the University holds its Chinese students. It was wholly inappropriate and I apologise wholeheartedly for the offence it has caused," the Vice-Chancellor wrote in her letter. She especially mentioned the success of XJTLU and expressed how the university was honored by its strong links with China and XJTLU. The letter said procedures will be reviewed to take appropriate action to ensure "nothing of this nature happens again." Online opinion was divided on the apology, with some saying it was "fair and sincere," while others said it should not be an excuse for racial discrimination. A Chinese student, surnamed Chen, who studies at the UoL, told the Global Times that the Vice Chancellor's apology was a positive move. But he wanted to see that the university fundamentally understood that the vast majority of Chinese students who study there earn their degrees on their own merits. Chen said he has indeed seen and felt sorry about Chinese students caught cheating in the previous exams. "But this kind of behavior only happens to a few Chinese students, and the notice from the university will only increase the local people's misunderstanding of Chinese students as a whole," he stressed. Thomas, a local British student who is also studying at the UoL, said students from China were not the only ones caught cheating in exams. "It reflects the communication between the university and the Chinese student community has not been successful." During the online furor, many voices criticized both Chinese and overseas social media, saying that some Chinese students did indeed engage in "bad behavior" during their overseas study, such as cheating in exams and plagiarizing papers. "Respect doesn't just come out of thin air. You have to fight for it yourself," wrote one Weibo user. "I don't think it is a cheating culture, but it is a different culture, as one might expect. It is on us (universities) to help them bridge any gaps when they're studying away from home," another student commented on the discussion board. While the UoL behaved improperly, Chinese students do need to improve their understanding of cheating, even if sometimes they do it unintentionally. Chu Zhaohui, a researcher at the National Institute of Education Sciences, told the Global Times that avoiding suspicions of cheating can be a "complex problem," which concerns not only students' personal qualities, but also the evaluation methods of different education systems. For example, the SAT exams judged that Chinese candidates cheat, not in the examination room, but through a comparison of papers, as a certain proportion of similarity is considered to be cheating. But in China's exam-oriented environment, some Chinese students may be used to reciting standard answers, which may eventually lead to a high level of similarity in their written answers, he explained. Chu suggests that in order to avoid frequent occurrence of this kind of "cheating," it is necessary to first change the inherent educational philosophy of Chinese students and teaching staff, encouraging them to move the focus from "standard answers" to independent thinking and practical experience. He recommends improving China's school education and evaluation system, eliminating the factors that may lead to misunderstanding, and narrowing the gap between student's evaluation system in China and other countries.